Be it resolved climate change is mankind’s defining crisis, and demands a commensurate response. within our power to influence? beyond our ability to control? Instead, it was carefully focused on whether climate change is the most pressing problem currently facing humanity, as the thousands of souls jetting off to Copenhagen apparently consider it to be. Elizabeth May, the leader of Canada’s Green Party, and George Monbiot, UK newspaper columnist and author, argued the “pro” position. Skeptical Environmentalist author Bjorn Lomborg and former UK Chancellor of the Exchequer, Nigel Lawson, argued against. A video of the entire 2-hour debate can be viewed here. It appears that, at a later date, a transcript will also be available. 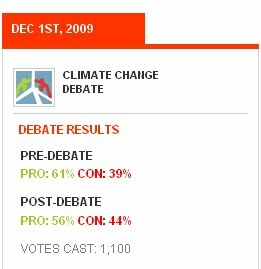 What’s interesting is that while Al Gore and others insist “the debate is over” few of us have actually witnessed a genuine debate on this topic. Instead, via the mainstream media, we’ve been force-fed one particular perspective. So what happens when multiple points of view are granted equal time to make their case? Opinion shifts. But not in the direction environmental activists would wish. When the 1,100 people entered the auditorium they were asked to vote. 61% considered climate change to be “mankind’s defining crisis,” while 39% thought otherwise. The verdict: support for the motion dropped from 61 to 53%. Opposition increased from 39 to 47%. In other words, when people are given a chance to hear both sides of the story, public opinion shifts from roughly 2 to 1 in favor of the view that climate change is our top priority to pretty much evenly split. This means the debate is by no means over. In fact, it’s a good indicator that the real debate hasn’t yet begun. When nations or organizations make profound, reboot decisions about the future (such as when they amend their constitutions), they typically require a super-majority in the neighborhood of two-thirds to 75%. Last night produced nothing like a super-majority in one direction or the other. UPDATE: Dec.3 – The error on the Monk Debates website, discussed below, has been corrected. Producer David Taylor apologizes and advises that there were 583 PRO votes post-debate and 517 CON votes. Thus, the above numbers are accurate. P.S. I’ve just noticed something rather curious. 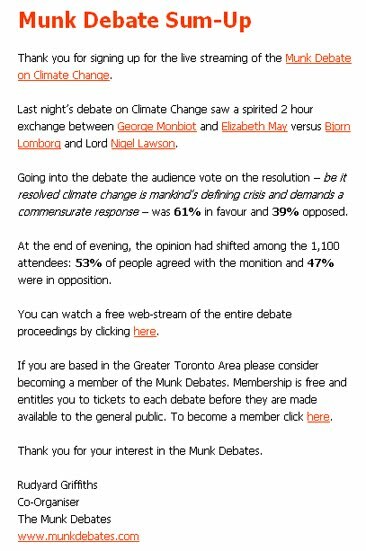 The post-debate numbers displayed on the Munk Debates website are different from the ones distributed in the e-mail. The website says the results were 56% pro and 44% con – not quite as large a shift. Strange. But the larger point remains. The position advanced by May and Monbiot lost ground last night after the audience was exposed to an alternative perspective. This entry was posted on December 2, 2009 by Donna Laframboise in Al Gore, free speech and tagged al gore, Bjorn Lomborg, Elizabeth May, free speech, George Monbiot, Green Party of Canada, intellectual freedom, Monk Debates, Nigel Lawson.